Wayne Z Hudson was born and grew up in Burnie, Tasmania. 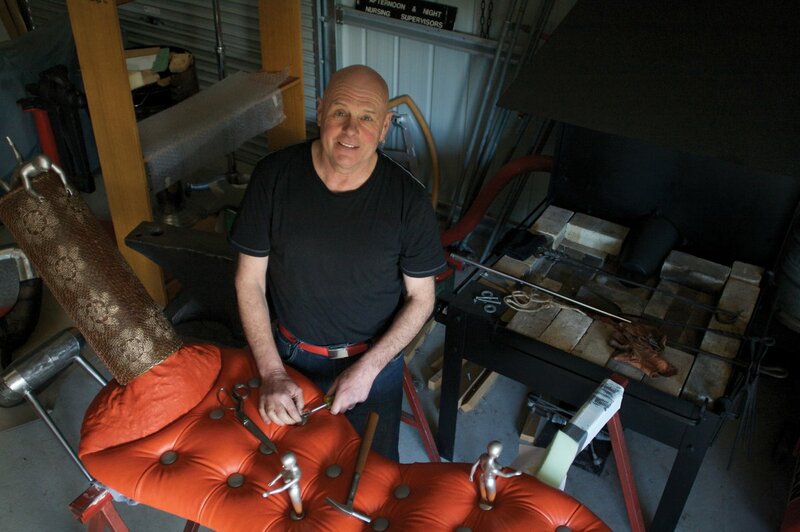 He studied Furniture Design and Sculpture, School of Art, Hobart, completing his PhD in 2001. In 1991 he received an Australian Council grant to travel to Europe and America. He completed internships in 1993 and 1997 at Albert Paley Studio’s in Rochester, New York. He was artist in residence at Unitec, Auckland, New Zealand and awarded a three month residency at the Rosamond McCulloch Studio in Paris in 2000. Wayne has had numerous exhibitions, prizes, grants and 27 Commissions in the Art in Public Place program. From 2002 to 2012 he was Head of Sculpture at the School of Visual and Performing Arts, Launceston, University of Tasmania. His work focuses on the space between functionality (seating) and sculpture. He is also interested in telling stories that relate to his Tasmanian experiences and his families settlement in Tasmania since 1855. Wayne’s methodology is based on using traditional techniques and lost crafts such as forging steel, wet molding and stitching leather where he combines them with contemporary technologies. His intention is to extend the boundaries of soft and hard materials in a way to invite visual ambiguity, there-for highlighting the tactile and sensual properties that become inherent in his work. He became interested in the geology and ideology of the West Coast while working there in the 80s. The Tyndall Range and Henty River are of special interests for the current work and ongoing research.